The new and improved Rigid Q Series PRO Line of LED Lights are for the customer who demands high power lighting. 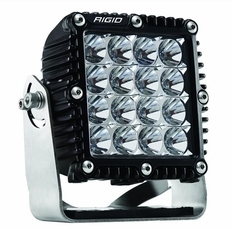 The Rigid Q Series LED Light features the same output as 4 Rigid D Series LED Lights. Ideal for heavy duty commercial and industrial environments, fire and rescue, and off-roading, the Rigid Industries Q Series Light measures 6.79� x 6.75�. They have a depth of 3.42�. The light output is a blinding 12672 raw lumens with an 8.8 amp draw and 123 watts from its 16 powerful LEDs.